Wow, Catholic vs Christian, eh? 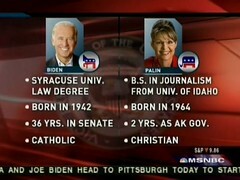 Nice job there MSNBC. Update 2008-09-01: Here's some samples of what kind of Christian Palin is: Palin and Her Pastors (Harpers).